A hack that exposes millions of customers’ data. A major holiday product launch pushed into next year. A chairman’s immediate dismissal for misconduct. An employee’s misstep gone viral. The circumstances of a corporation’s next major crisis vary, but its appearance is inevitable. Less inevitable, however, is a company finding a positive outcome in the wake of a crisis. While of course no leader would ever wish for crisis, it doesn’t need to spell disaster. 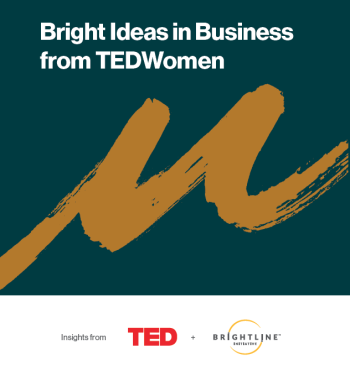 On the contrary: Our research suggests that it’s possible for certain opportunities to emerge from crisis and have a lasting positive influence on a business. 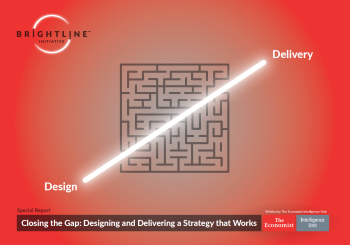 A crisis can bring out the best in your staff, unearth improvements in processes, and reveal new business opportunities, all of which can—and should—influence post-crisis strategy design and implementation. 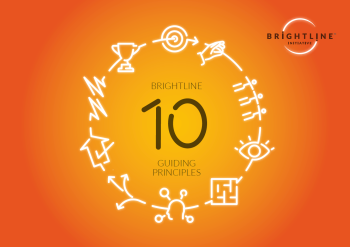 Quartz Insights, in collaboration with the Brightline Initiative, set out to identify the ways that organizations can best leverage the experience of a crisis and use those learnings to improve the way they integrate strategy design and delivery. 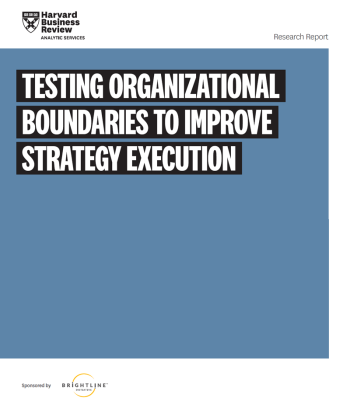 We surveyed more than 1,200 senior global leaders and executives from the government, non-profit and the private sector about management decisions and organizational strengths during and after crisis events. 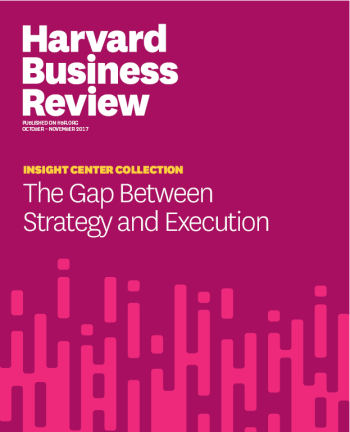 This report summarizes our findings and includes interviews with executives who have experience and insights into crisis management around the globe. 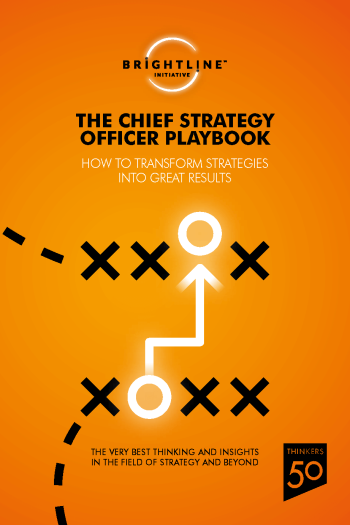 The executives we interviewed explained how they prepare for crises; how they reorganize processes and reallocate resources when a crisis hits; and how, following a crisis, roles, protocols, and procedures can evolve, perhaps permanently. 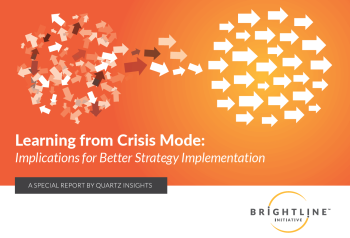 The majority of leaders report “significant changes” during and after crisis, and our hypothesis was that these changes can expand beyond the crises themselves—that the way organizations behave in crisis can inform their strategy implementation processes afterward. 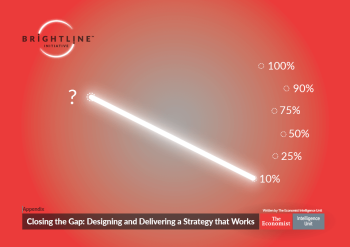 With 75% of respondents agreeing that their organization’s strategy implementation capabilities grew stronger as a result of the crisis, our goal was to discover how companies can reap these benefits without experiencing a crisis. 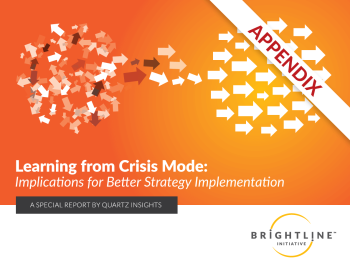 In the spirit of letting no good crisis go to waste, the report provides actionable ways that you can learn from the experiences of hundreds of others who have faced the challenges of crises and successfully applied learnings from them to strategy implementation—without needing to weather a crisis yourself. There is also an appendix, make sure to download it.